An atmospheric chemist with extensive teaching experience joins Geosciences. After teaching meteorology for a year as a visiting lecturer, Timothy Logan has been appointed instructional assistant professor in Atmospheric Sciences. Logan received his Ph.D. and M.S. from the University of North Dakota in atmospheric science, with a concentration in atmospheric chemistry. He received his bachelor’s degree from the University of Virginia in environmental science with a concentration in geochemistry. His research interests are the chemical and physical nature of mineral dust, biomass burning and pollution aerosols and their influences on marine boundary layer clouds and deep convection. He has developed an aerosol classification method based upon Asian aerosols that can be used in other regions. 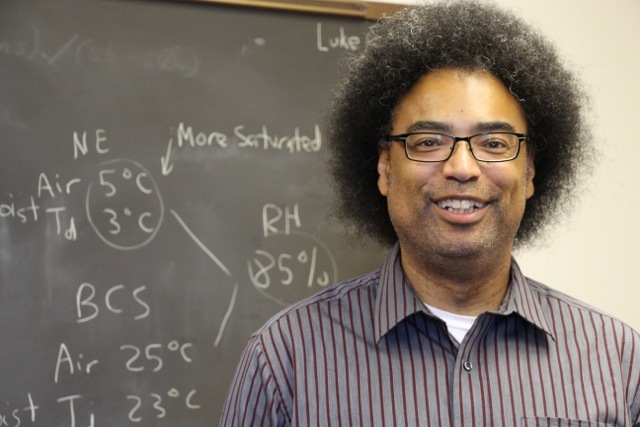 He has presented at various conferences and workshops on atmospheric chemistry, physics, aerosol properties and their connections to cloud physical properties, deep convective processes, and climate change.